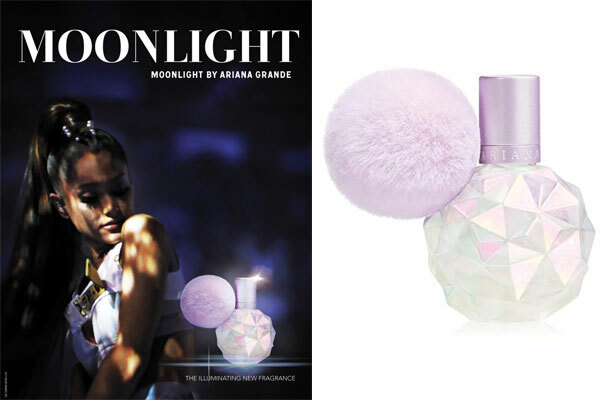 Moonlight by Ariana Grande is a new fruity floral perfume. The new illuminating fragrance for women is the singer's fourth celebrity scent and includes notes of juicy plum, blackcurrant, fluffy marshmallow, peony, black amber, sensual vanilla, and creamy sandalwood. The original ARI perfume bottle gets a pearlescent update and features a lavender cap and pom-pom accent. Launched in September 2017, this new perfume is available from ULTA and Macy's in eau de parfum spray (1 oz - 3.4 oz, $39-$59) and rollerball ($20).